Disney and the Weinstein brothers had a difference of opinion which had nothing to do with a novel which had nothing to do with a film starring Tom Cruise. 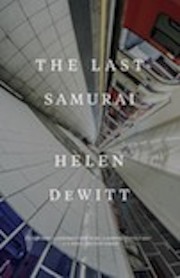 The Last Samurai was out of print for several years. It has now been reissued by New Directions. American and Canadian readers can, if they like, now buy it as an e-book, a format hitherto available only to those who could pass themselves off as residents of the UK. Readers can order the book new from any of the following online retailers, or, of course, visit their local bookstore. (The local bookstore can surprise you in a way that an algorithm-driven online retailer can't. As René Char once said, comment vivre sans inconnu devant soi? How can you live with nothing unknown ahead?) Some readers - the sort of reader who bought 40 secondhand copies for friends and family in the out-of-print days - may still be drawn to the economies of the secondhand market; they can still, if they like, do what readers did in those days, and send the author a goodwill gesture via PayPal.